(Back Row) Duncan Ross, Ross Gray, Dean Gerrard, Matt Foster, Calum a Reddish, Rory Mellis (Captain) Richard Leadbeatter, Finlay Stewart, Alasdair MacLeod, Adam Hunter, Lyle Venters, Ross McKenna. Welcome to the 1st XV homepage, here you will find match reports, pictures and information relating to the 1st XV. 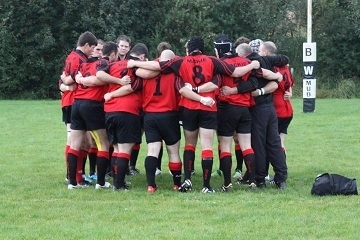 Mackie 1st XV is the flag ship team of the club. Taking the best players from a squad of over 60, for season 2014-15 the 1st XV will again be competing in BT Caledonia League Division 1. The philosophy of the senior squad is 'if you don't train you don't play' - simple as that. Every one of our players is committed to this, and with hard, enjoyable training the vibe running through the club is awesome! If you want to join us, get in touch or come along to training to meet us all!